Ever dreamt of having your own luxury bathroom straight out of a five-star hotel? Why not splash out on some of these luxury features? They’ll make bath time feel like spa treatment and could help to increase the value of your home. Most bathrooms have cold tile floor surfaces that aren’t nice for walking on in winter. Underfloor heating can keep your feet cosy for when you get out of the shower. It can also help to keep the room dry – puddle of water can sometimes lead to mould growth in homes and underfloor heating can prevent this. For keeping your towels dry, a heated towel rack is a great feature. This can double up as a radiator providing heat for the room. There are lots of contemporary and traditional designs available to suit all bathroom types. If you hate having to clamber into a slippery bath to take a shower, it could be worth installing a separate walk-in shower. These can be incorporated stylishly into your home. You might be able to make use of a recess to put this in if you have an oddly shaped bathroom. When it comes to shower itself, consider having a combination of two showerheads – an overhead fixed one and a flexible handset showerhead. A modern standalone tub can help to improve your bathing experience. You don’t have to worry about bumping your elbows against walls and can opt to have the taps located in the centre allowing you to rest your head back. 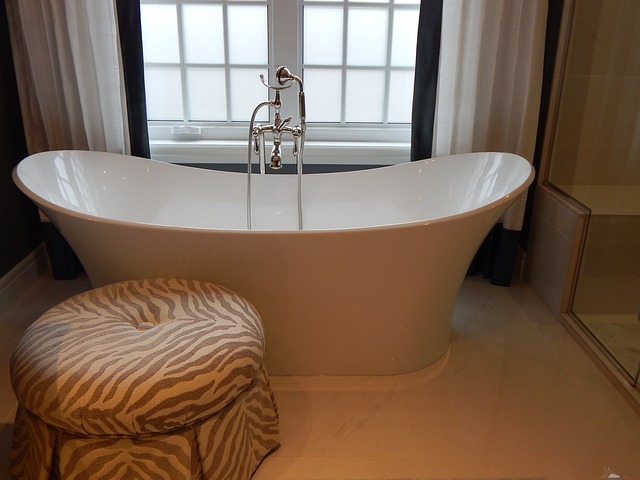 Freestanding tubs do require you to have a fair amount of space in your bathroom. There are lots of different designs out there – one of the most popular is the slipper shape which curves up at the end. There are lots of funky tap designs out there that could also help to make your bathroom feel that extra little bit more sophisticated. Waterfall taps are a fantastic statement piece and can look great on a bathroom sink. Another option could be wall-mounted taps to help give a contemporary style. Chromatherapy is a means of using mood lighting to help relax. In some very swanky hotel bathrooms you may find this type of low-level colourful lighting. You can buy tubs with in-built chromatherapy lights or you could fit them on the walls. It’s certain to give your bathroom the edge and impress guests and potential buyers if you plan to sell. You can also bring some aromatherapy to your bathroom. This could include lighting some scented candles or growing some freshly scented flowers in the corner of the room. Of course, you can also experiment with bath bombs and soaps to make you feel that extra bit fresher.